← Can Winning NaNo get any cooler? It’s pumpkin rum cake with walnuts (I didn’t have pecans like the recipe called for but whatev’) and it definitely is NOT low fat, low sugar or low calorie. Suffice to say it used 2.5 sticks of butter, 4 eggs, and 2.5 cups of sugar. And there’s alcohol too, the real stuff, only don’t tell hubby, but I added it early in the cooking process so most of the alcohol probably cooked off. 1. Mix dry ingredients (flour, spice, soda and salt) and set aside. 2. Beat 2 sticks of softened butter with 1 cup sugar and 1 cup packed brown sugar until light and fluffy. 3. Add 4 eggs and beat well. 4. Add canned pumpkin and 1 tsp vanilla. 5. Gradually combine flour and pumpkin mixtures; mix well. 6. Place 3/4 cup of chopped nuts on bottom of greased 12-cup bundt pan. 7. Pour batter over nuts. 8. Bake in preheated 325 degree oven for 60-70 minutes or until toothpick inserted in cake comes out clean. 9. Cool 10 minutes then make holes in cake with long pick. 10. Make glaze by melting 1/4 cup of butter in a small saucepan. 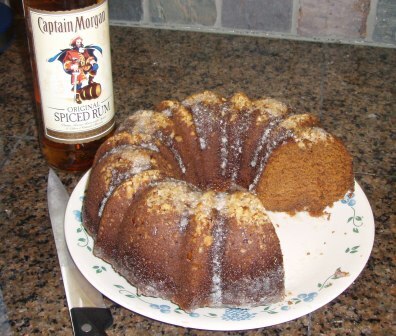 Stir in 1/2 cup of sugar and 2 T of rum and 1/2 T of water. Bring to a boil then remove from heat. 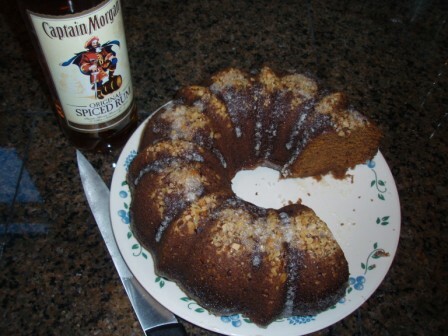 If using rum extract, mix in 2 T water only then add rum extract after removing from heat. 11. Pour 1/2 of glaze over cake while still in pan. Let stand 5 minutes.